Never remove snails from the water for an extended period because they will die when all the moisture dries. Remove dead snails from the water immediately and discard them. Freshwater snails can appear dead in aquariums, but they often just remain inactive for many days. Sometimes the snails float to the surface of the water due to the air in their lungs. If you suspect that the snail has died, you need to remove it from the water carefully to inspect it. 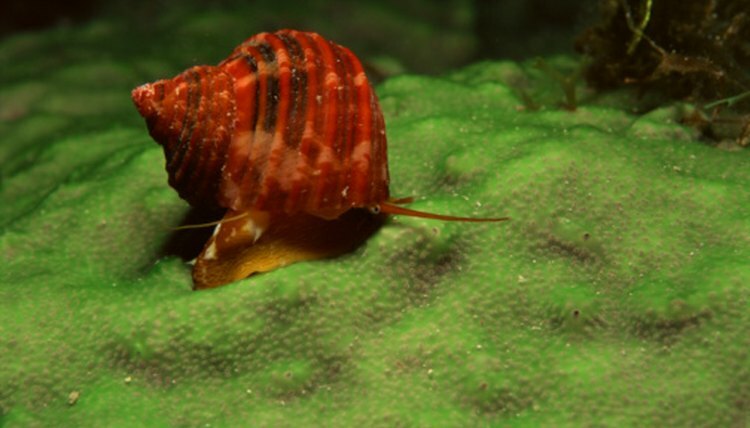 Leaving a dead snail in an aquarium can result in the spread of disease. Before you discard the snail, inspect it carefully to ensure that it is actually dead and not inactive. Remove the snail from the water. Locate the opening near the body of the shell. Smell the shell carefully. If the shell smells rotten or foul, the snail has died. Examine the water snail shell carefully. If the body of the snail is no longer inside the shell or if the snail hangs out of the shell and does not move, then the snail may have died. Locate the trapdoor on the snail’s body. The opening will remain shut when the snail remains alive, but it will remain open when the snail dies. Hold the snail shell in front of a light source such as a flashlight. Look at the heartbeat to determine if the snail remains alive. You can only see the heartbeat in young and thin-shelled snails.